My 3-year-old 2013 sea doo gti 130 stock battery was sounding flat even after a charge so it was time to replace it. 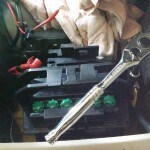 Se-doo battery replacement procedure is a simple task that anyone can do in an hour. 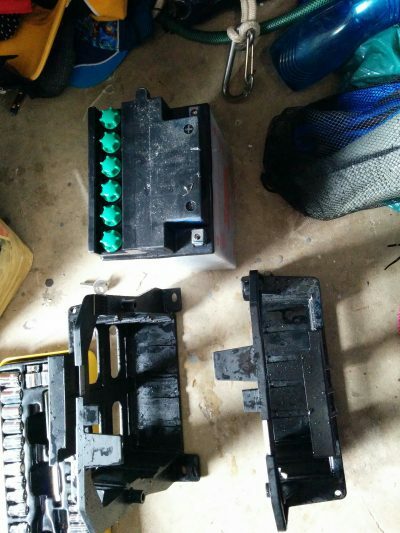 Lead acid Batteries generally only last 3 to 4 years in most vehicles, especially jet skis, so when they start to give you trouble is best to change them out immediately. You dont wan to be out in the ocean and be not able to start your jet ski. Unless you have a portable lithium jump starter. Especially if you are out fishing in your Sea-doo. Restarting is very important. 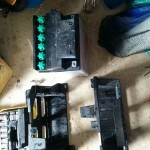 This battery replacement project for your bombardier BRP sea-doo can be done in around 1 hour. The following items will be required. 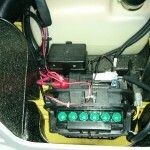 First, remove everything in the front compartment of the Sea-doo PWC. Once you have a good clean area, is time to remove the 2 black plugs from the bottom. These have 2 parts to them, a middle plug that has to be removed first then an outside plug that can be pulled out after. The 2 side panel cover plates can now be removed by lifting up and out forward. You will now have access to the battery. 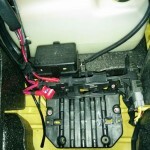 Start by cutting off any cable ties that may be holding cables onto the battery box. 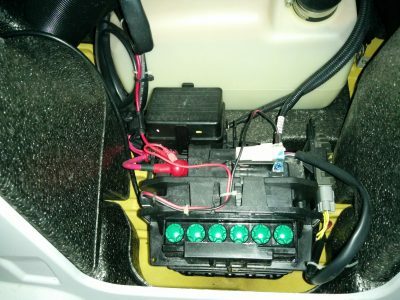 The sea-doo fuse box is connected to the battery box by a clamping system and the whole thing can be levered off from the top. 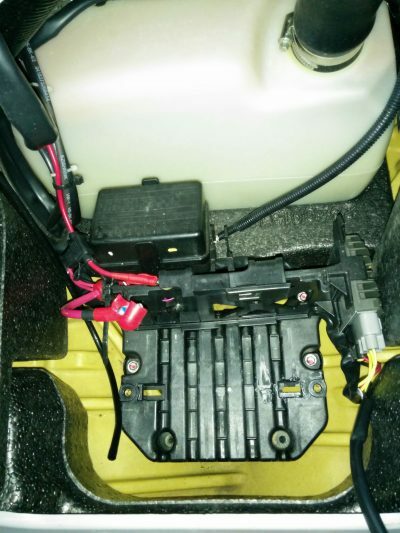 I just put a screw driver in the middle of the sea-doo fuse holder box and lifted up. The battery box holds down the battery very securely, and there are 2 bolts at the very bottom of the box that needs to be removed. Be care full not to lose the washers on each bolt, I undid them but left them in the box. You can then lift up the box and take it out. 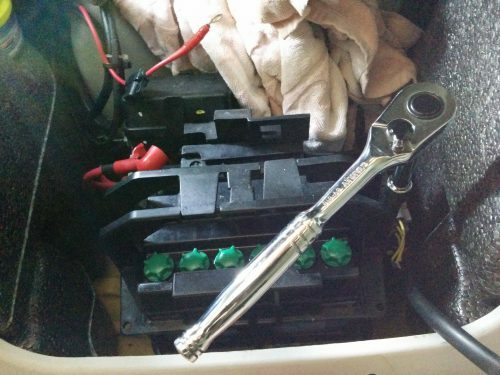 Note: there may be a vent pipe for the old battery which will also need to be disconnected. I just left it in the ski but tied it up high onto one of the air vent pipes. These pipes wont be used anymore with the new gel AGM battery. Once the battery holder is out you can open it up and take out the Sea-Doo battery. This is done by the 2 plastic tabs. There are also 2 clips on the bottom of that slot into each other. Open it up and take out the battery. Give it a good wash under fresh water to get rid of any old acid spills and dry it completely. Put the spacer in and then put the battery on top of the spacer. 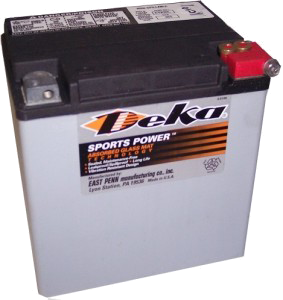 Now I ordered my battery online to save some money which is always good I ordered the Deka ETX30LA which has the included spacer. The problem with buying online is sometimes the wrong part is sent or it is broken, but that’s rare. In my case I was sent the wrong battery they sent me the Deka ETX30L, not the LA So the L doesn’t include the spacer which was annoying. So a few phone calls later all was sorted and they would send me a replacement spacer. But it would take a week or two. As I was wanting to ride on the weekend I decided to make my own spacer and install the battery. I made the Sea-doo battery spacer out of 20mm HDPE (High-density polyethylene sheet) that I had left over from another project. Cut to size with holes drilled in it for water drainage. I also rounded the corners as it wouldn’t fit with square corners. All of a sudden my Sea-doo battery replacement job that should have taken an hour is now taking 3 hours. 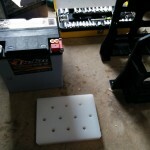 Just measure around the base of the ETX30l battery and cut out your spacer. It’s basically the reverse. Install the Deka ETX30LA battery and holder pack back into your ski, take care of your back as it is an awkward position. I use a small stool to stand on, so I could reach further down into the front of the PWC. Line up the Sea-Doo battery pack and screw it down, use some blue thread locker. 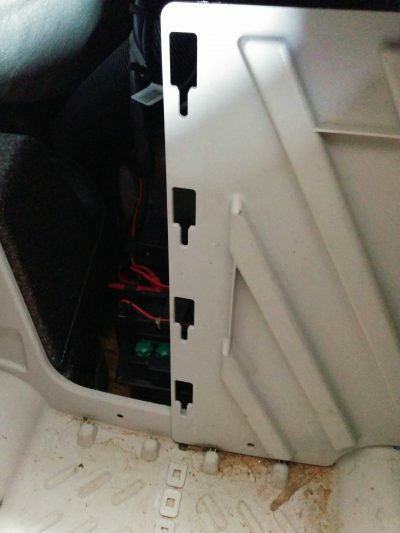 Once secured you can re attach the fuse box holder bracket. It’s a bit confusing but the simple steps are it slots down on the bottom and you re clip in the top. 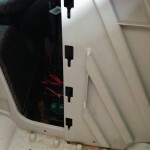 You can now attach the main power cables and any auxiliary cables you may have. I had an extra battery charge cable and also a fused power cable for the bilge pump. Cover the terminals in silicon grease to stop corrosion on the connections. Water will often drip into this space. If too much water you may have to install a rule bilge pump. Check all cables for tightness and cable tie off any slack cables. 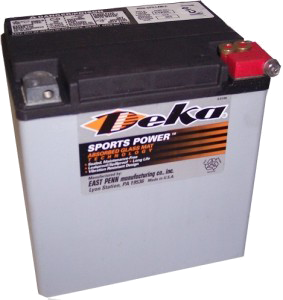 Job Complete, start your Sea-Doo and enjoy the extra starting power from your new Deka Sea-doo Battery. Your Sea-Doo battery voltage is usually around 12v, but this can fluctuate when the jet-ski is running. The voltage can go up to 13v or slightly higher when charging. When starting up your Sea-Doo or Yamaha your battery voltage should stay at 12v or slightly dip. If your voltage drops too low say to 11v your battery is getting worse and should be replaced. How much is a BRP Sea-doo battery? The reason I wanted to do this Sea-doo battery replacement procedure myself was that the local Sea-doo dealer wanted $350 to do the job. That means they are making like up-to $200 on each Sea-doo battery job. A Sea-doo battery is between $100 to $200 if you buy it yourself, depending on the model and place of purchase. Better dollars in my pocket and yours. Nothing destroys an SLA battery faster than letting it go flat. This causes Sulfation, which is a build-up of lead sulfate crystals onto the lead plates. This causes the battery to hold less charge. It causes early failures of lead-acid, sealed AGM batteries. All Ctek models have a patented method for reconditioning sulfated batteries. The charger analyzes the state of the battery and, if possible, recovers the battery and its power. Including the famous CTEK (56-864) MUS 4.3 12 Volt Fully Automatic 8 Step Battery Charger. It’s the one I have and recommend. I have done this to an old car battery and it has brought back more charge capacity to the battery but not the whole lot. Better than nothing. So the best way to take care of your new ETX30LA sea-doo battery is with a regular top-up charges or by using a battery tender. 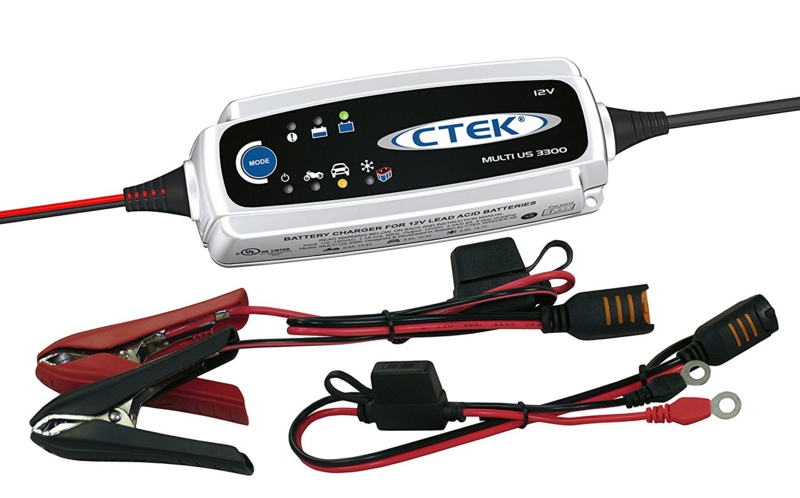 The CTEK MULTI US 3300 is a very popular battery charger, that has a compact design that makes it convenient and easy to charge and maintain all household vehicles. From cars, motorcycles, ATV, SUV and Jet skis. Its a 4 step charger simple, reliable and cheap. The one above Ctek mus4.3 is an 8 step more functions and more options. if you are just after a simple charger the 3300 is the one to get. The special cold mode means that you can charge during the winter months without a problem. It is perfect for everyday vehicles. And not so every day. 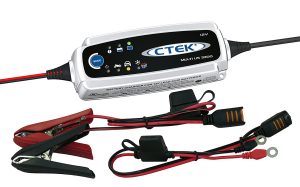 As it comes with eyelet cables called ctek comfort connect you can bolt the leads onto your Sea-Doo and just plug-in the Ctek battery maintainer charger when you are ready for some extra charge. The ctek multi-use 3300 3.3a battery charger comes in its own case to store the clamps, cables, and charger. A nice little feature is each cable is fused to provide extra safety should anything wrong happen like a short out. There are no issues with over charging as the Ctek will keep the PWC battery topped up all year with trickle charge. I just thought I would let you know about this charger as it should give you better life out of all your vehicle or jet ski batteries. We ended up doing a review for smart battery tenders for motorcycles and jet-skis. It was against 2 top main companies CTEK and NOCO. The results actually surprised us with the NOCO G3500 Genius battery tender coming out on top, due to being able to support CANbus and being cheaper than the CTEK MUS4.3. Even though the CTEK show above is a great cheap 4 step charger you should check out the 7 and 8 step chargers that are only a few dollars more. All the best for your Sea-Doo Battery Replacement, and enjoy all the extra power and reliability from the ETX30LA battery. Well, let’s continue with the theme of best battery everything for your Sea-Doo. 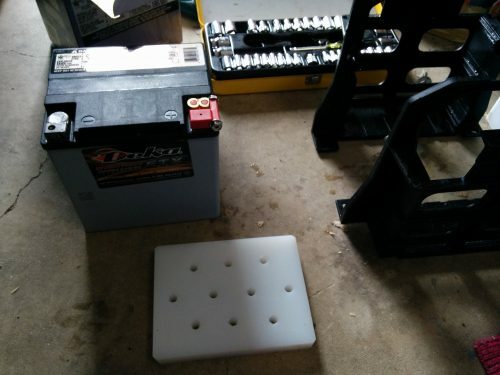 We ended up testing a whole heap of Lithium Ion Jump Starters for Cars, boats, and Jet-Ski. Check out our full review, as its too much info to post again. Don’t get stranded. Have a backup plan.